Class Fee: $0 Includes All materials will be included. During part 2 of this class, the fun really begins! We will use everything at our disposal to transform our books; we will use journaling techniques to add poems and personal expression to our books! 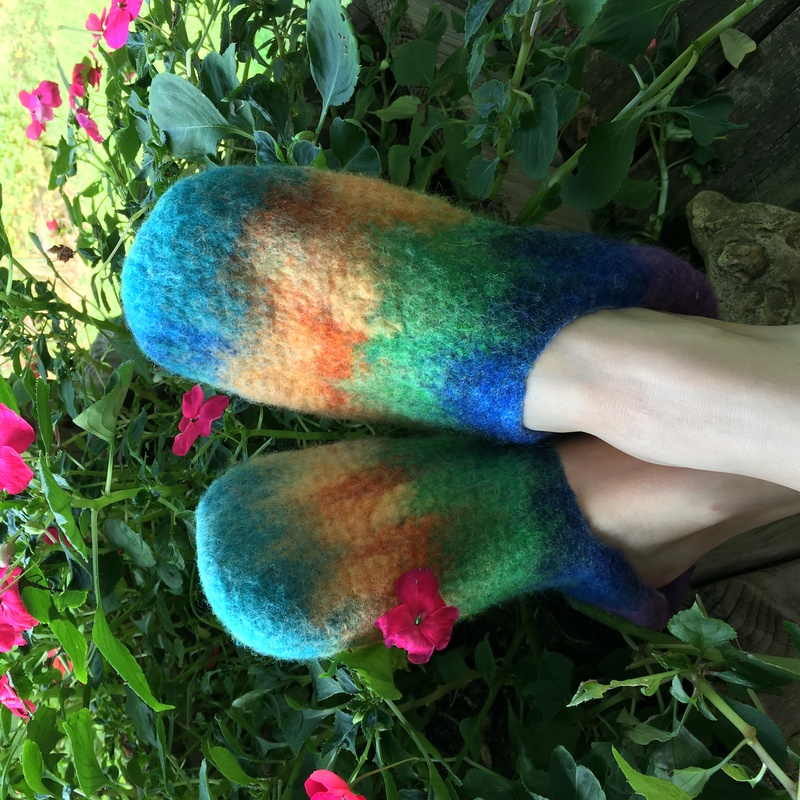 Create a pair of custom wool slippers or slides! Using a resist that will be specifically cut to fit your foot, you will lay out beautifully dyed wool fibers to create warm and wonderful slippers. This wet felting project will introduce beginning and experienced feltmakers to the joy and delights of felting with wool. Class Fee: $25 Includes All materials and use of equipment included. 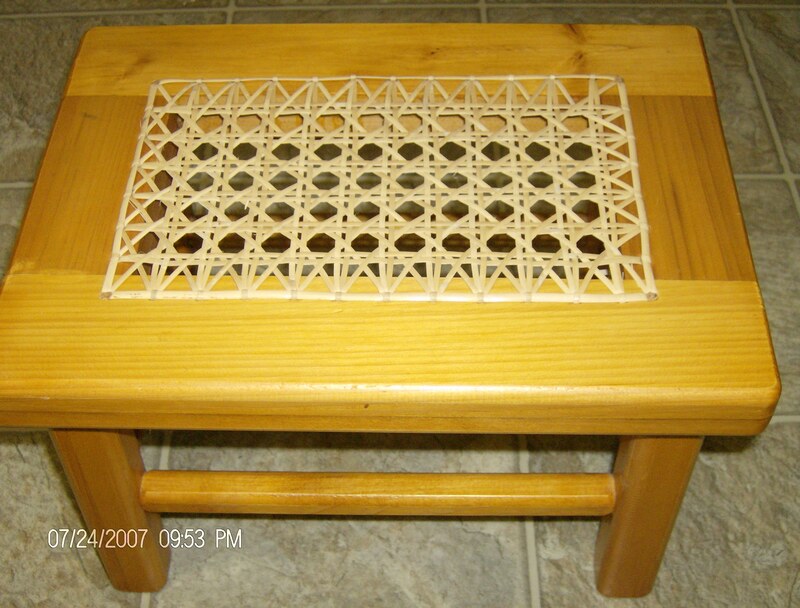 Weave a seat on a small stool using the 7 step method. Students may bring their own chair, but must call me a month in advance to assure proper size material is available. This class takes two 3 hour time slots to complete. Will be continued on Saturday morning! 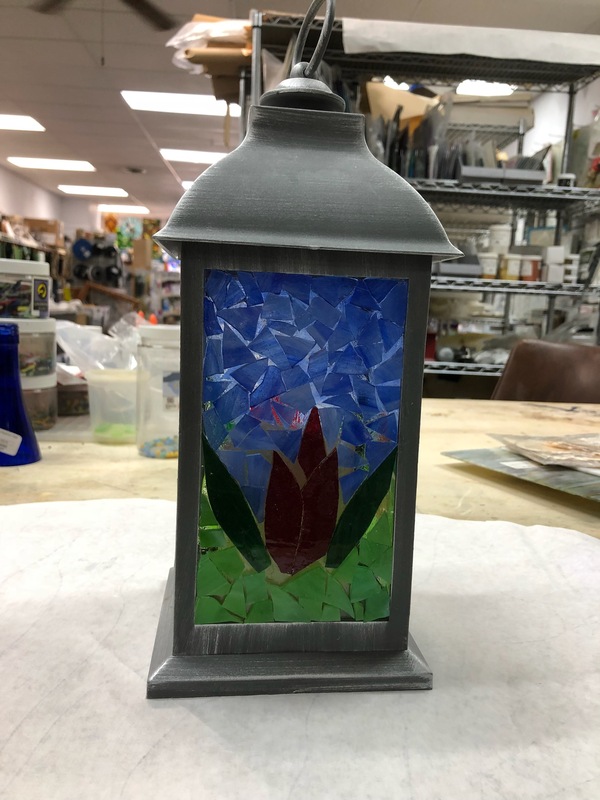 Learn to make a mosaic lantern using stained glass. Lantern with LED light included. Class Fee: $40 Includes All materials included. This durable rug looks crocheted, but it isn't! Kathryn Tucker will teach students the technique of making a small table runner or rug using a needle made from a toothbrush and strips of fabric. Time outside of class will be required to finish the project. **Please call Kathryn regarding fabric. Class Fee: $12 Includes Wooden needle, pattern, safety pins. Equipment: Bring sharp scissors and/or a rotary cutter. Remember macrame? Or perhaps you don't want to? WELL. Macrame has been reborn into the 21st century, unapologetically, and it is certainly not your mother's macrame - new colors, new styles, new uses all make it a fun and even practical craft. In this class we will make a small wall hanging that will teach you all the basics and give you the skills you need to move forward into the new (and even tasteful) world of macrame. If you'd like to take the Macrame Purse class, this class will be a prerequisite for that. Level: All - No experience required; anyone welcome. Basic skills will be the focus of this class. Equipment: Sharp scissors, measuring tape, notebook, pencils. Learn how to make a luxurious soap at home in a crock pot and take home approx. 2 lbs of your own custom scented soap! Class Fee: $30 Includes All equipment/ingredients will be provided by instructor to be used in class. Equipment: Students should bring the following with them: safety glasses/goggles, rubber gloves, apron. 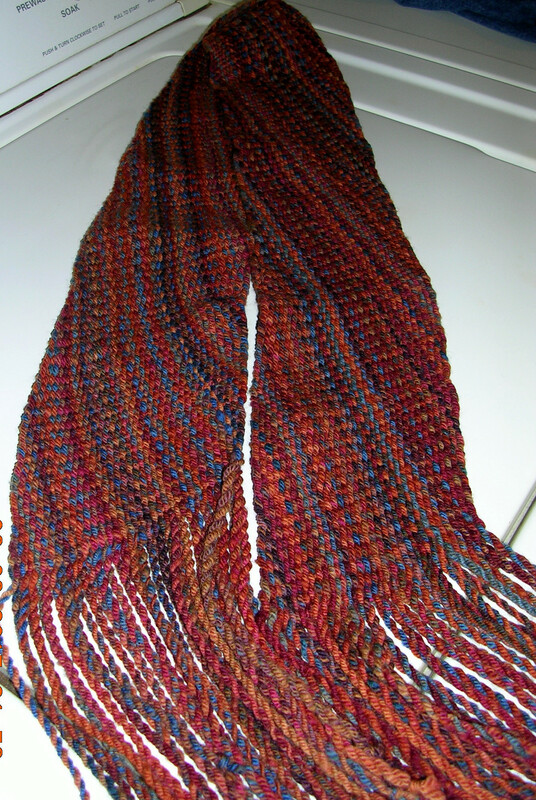 Students will learn to weave a scarf without a loom. This technique is common to Native American tribes. It can also be found in certain Eastern Europe traditions. Class Fee: $25 Includes A pre-measured skein of hand dyed, hand spun yarn will be provided along with the items needed to set up the weaving. 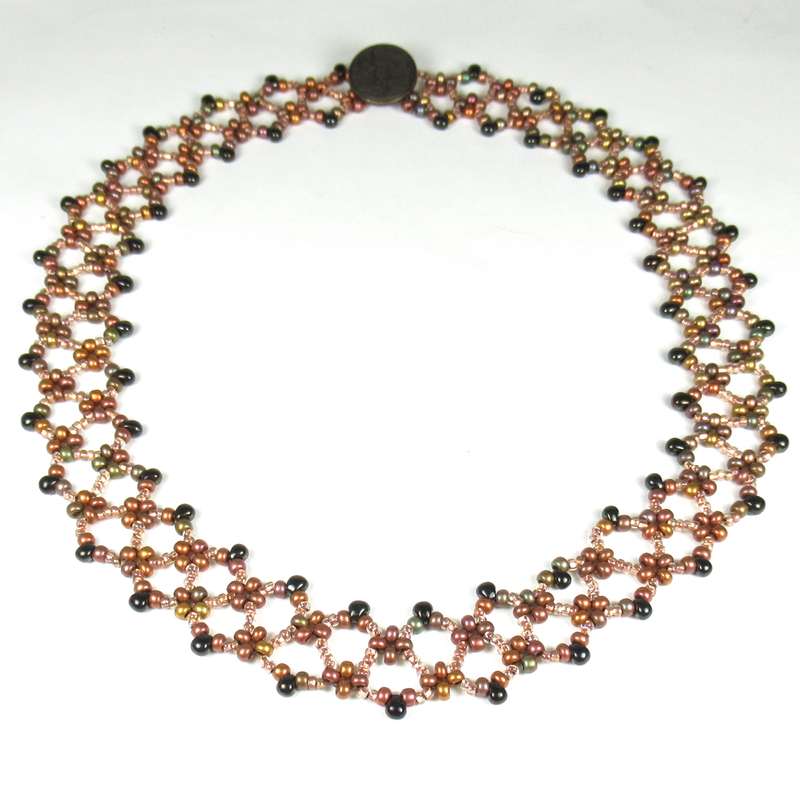 Using round and drop-shaped seed beads, stitch a soft, fluid chevron chain necklace which fastens with a button and loop. Don't want a necklace? You will have enough beads to make two or three bracelets (depending on wrist size). This chain is like Goldilocks: not too bold yet not too delicate, not too simple yet not too complicated - just right! For a larger picture, click here. Beading mats, scissors and thread conditioners available for use during class. Class Fee: $45 Includes Photo-illustrated step-by-step instructions, all beads, shank button, needles and thread. Choice of colours. Level: Beginner - Some seed bead weaving experience preferred; suitable for most. Equipment: Glasses for close-up work if you need them. Task lamp if desired. 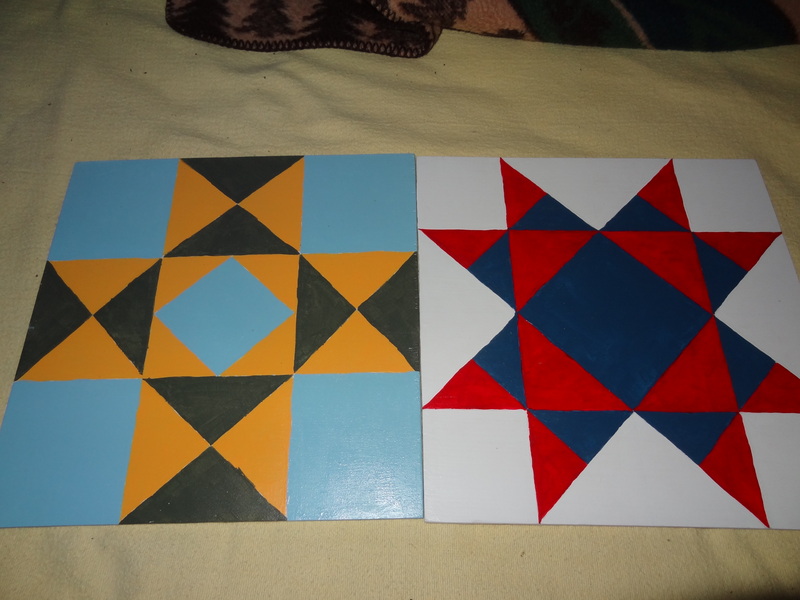 Using a 2 square foot pre-primed board, the class will go through each step of choosing a pattern, transferring it to the board and painting the pattern. We will use exterior paint so the block can be hung either inside or outside. Begin painting in class and finish on your own. Equipment: Yardstick for drawing on pattern and a hair dryer if you have one to help the paint dry. 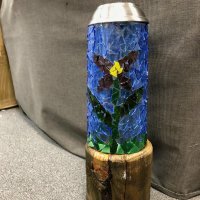 Learn to make a mosaic cylindrical light frame with stained glass. The finished light utilizes solar charged LED lights. Base and light included. 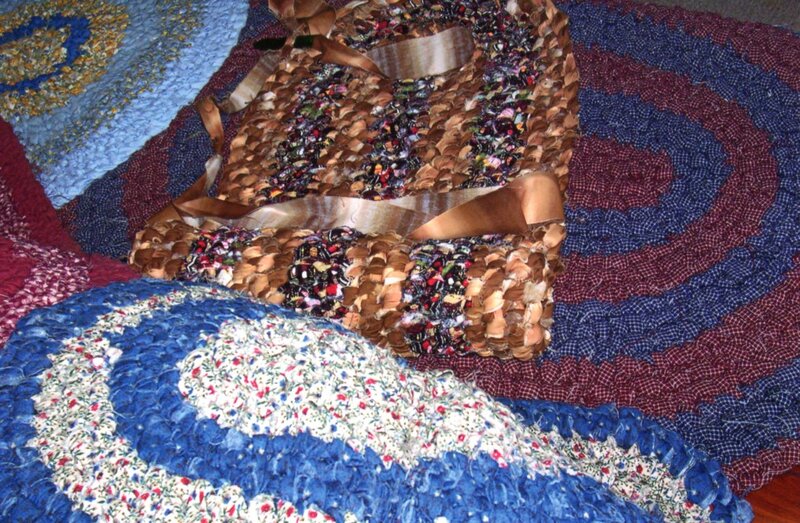 In the 1800s, the Penny Rug was constructed of wool to brighten a table. 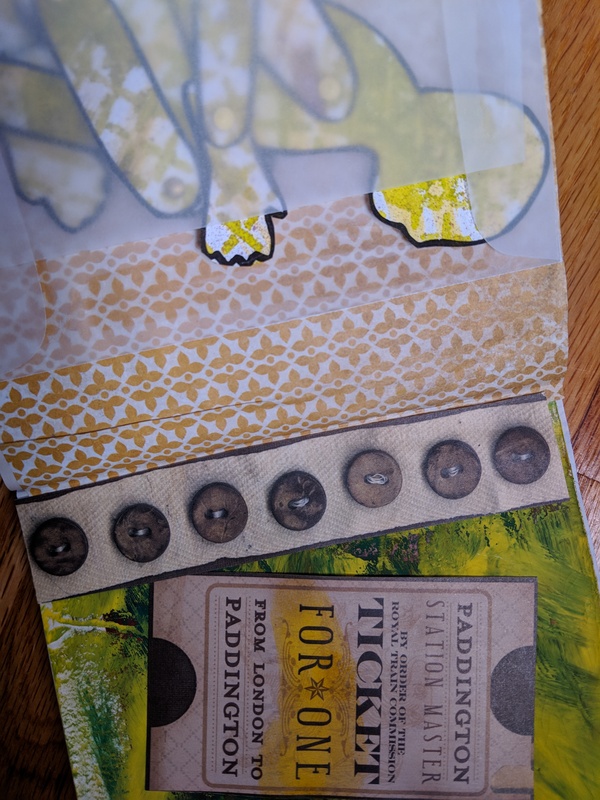 Kathryn Tucker will assist students in selecting heavy felt for the backing, creating pennies and figures, then stitching with a decorative blanket stitch. 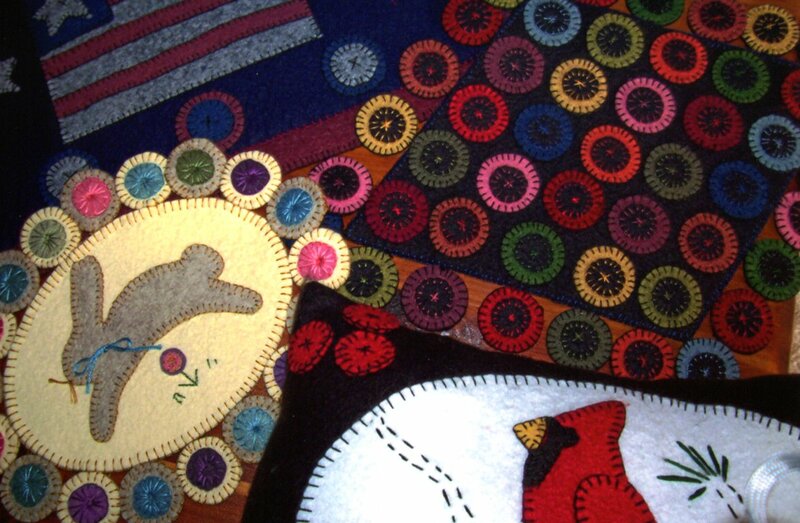 Class Fee: $18 Includes Wool felt kit, pattern, pins & needles, thread. In this class we will use a simple kumihimo braid to make an elegant bracelet on the kumihimo disc. Ends will be finished with a magnetic clasp. Class Fee: $30 Includes Instructions, bracelet kit, including satin rattail cord and magnetic clasp. Level: All - Some experience with kumihimo disc is recommended, but beginners are welcome. Concentration will be required! Equipment: One 6" kumihimo disc. I prefer the original Hamanaka brand, but Beadsmith is OK, too. You find these online or at just about any craft store now. www.braidershand carries the original. I will also bring some Hamanaka discs in case you are unable to find one. Sharp scissors, tape measure. Patience! This class will require concentration. Learn to construct a traditional ribbed basket. Class Fee: $35 Includes All materials to complete basket. Level: Advanced Beginner - Some weaving experience. Equipment: Bucket for water, old towel, scissors, small straight tip screwdriver, pencil, snap clothespins, spray bottle. Create some amazing, colorful art with acrylic paints! This technique involves mixing the paint with a flow medium and pouring it onto a stretched canvas. There is no artistic skill required, and the results are unique and beautiful. Class Fee: $20 Includes All materials and tools provided. Students will make two paintings. Equipment: Bring an apron or paint shirt. 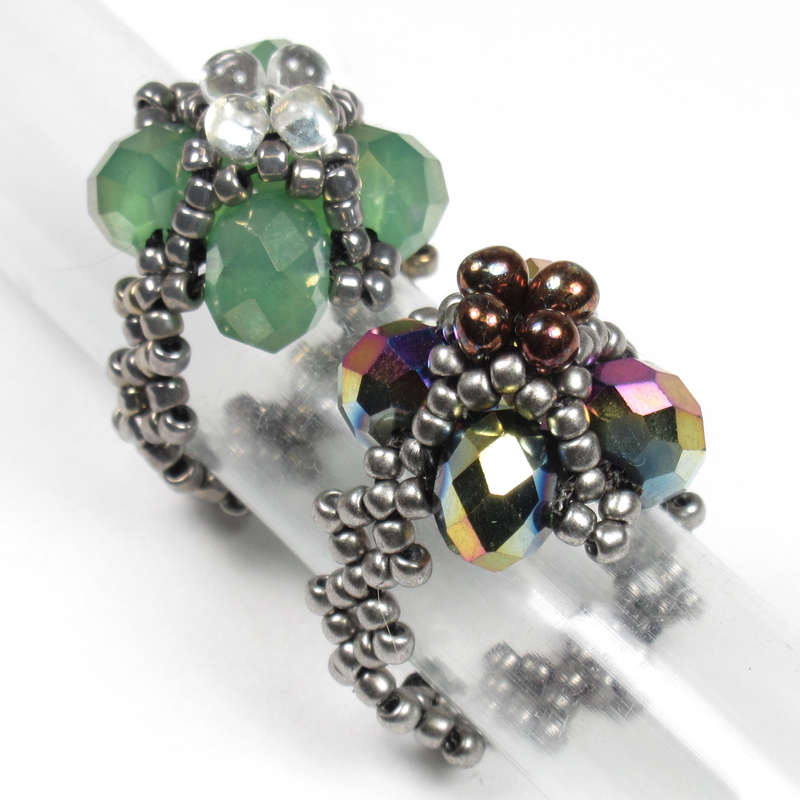 Use crystals and seed beads to stitch a sparkling cocktail ring that you will size to fit your finger. 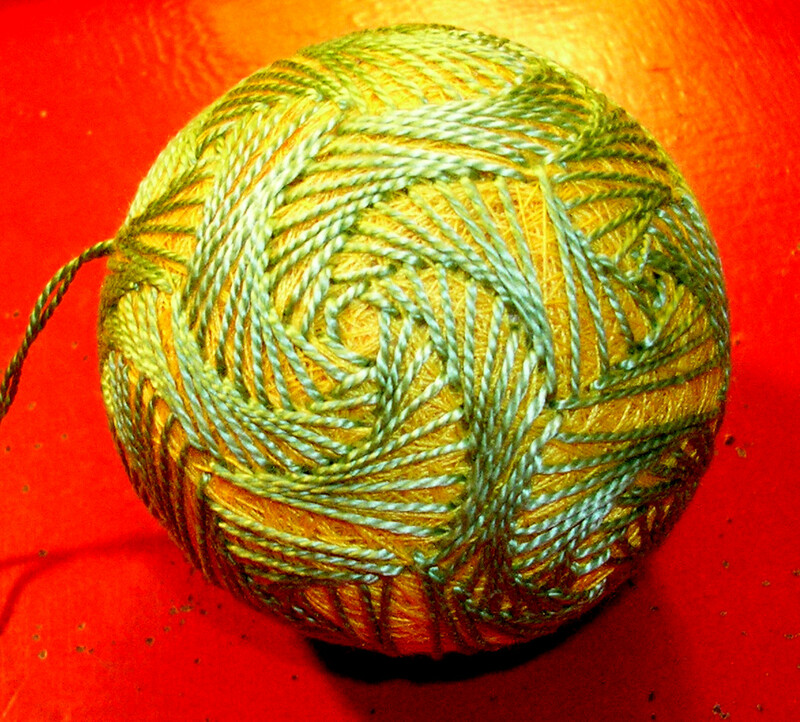 Time permitting, stitch a second ring using different colours. For a larger picture, click here. Beading mats, scissors and thread conditioners available for use during class. Class Fee: $40 Includes Photo-illustrated step-by-step instructions, all beads, needles and thread. Enough for two rings. Choice of colours. Yard Stake:Make a 4 1/4" square fused glass insert for a wrought iron yard stake and frame (included). Use a variety of glass shapes and embellishments. 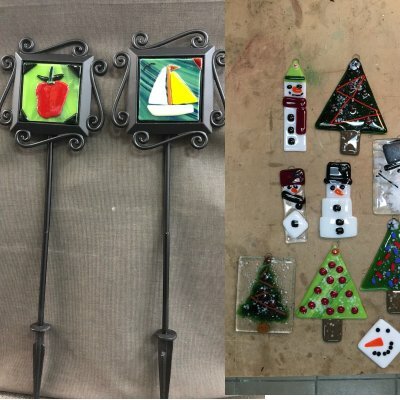 Fused Ornament:Make fused glass Christmas ornaments using precut shapes and small pieces of glass and embellishments. In this Hands-On class, students will learn how to preserve foods through the ancient art of fermentation by making their own Sauerkraut, Pickles, Kimchi, and other veggies. Students will have the choice to either take home active ferments or just the equipment necessary to begin fermenting on their own. Class Fee: $40 Includes Equipment, recipes and fermented food samples (for tasting) will be provided by the instructor. Equipment: Students are encouraged (but not required) to bring with them 2 pint size and 1 quart size wide mouth canning jars with lids and/or a head of green, red, or Nappa cabbage.